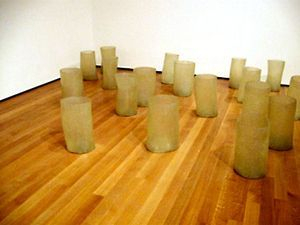 Eva Hesse's first sculpture, a relief titled Ring Around Arosie featured cloth-covered cord, electrical wire, and masonite. This year marked ...a turning point in Hesse's career. From this point on she would continue to make sculptures, which became the primary focus in her work. Returning to New York City in 1965, she began working in the materials that would become characteristic of her work: latex, fiberglass, and plastics ...In 1969, she was diagnosed with a brain tumor, and she subsequently died on Friday, May 29, 1970. Her death in 1970 at age 34 ended a career spanning only ten years. Plastics are used widely in many artistic applications, including: sculpture made from finished or formed plastics, the fabrication of props for theater and film, special effect make up, and plastics are used by museums and galleries in exhibits, displays, transportation and storage of art. Working with plastic resins involves chemically linking together many small molecules (monomers) to form the plastic (a polymer), or cross-linking many polymer chains with monomers to form a thermosetting plastic. Hardeners initiate the reaction. Catalysts, accelerators, fillers, pigments and dyes, and other additives are also used. Resins can be molded, cast, laminated, and foamed. Working with finished plastics involves changing the plastic physically, rather than chemically. These processes include heating, softening, bending, gluing, machining, sawing, finishing, and similar mechanical processes. Acrylic resins can be used for both casting plastics and acrylic cements. There are two types: monomer and monomer/polymer mixtures. Both types use benzoyl peroxide as the hardener. The monomer is methyl methacrylate. Polymerization is carried out at high temperatures which must be controlled carefully. 1. Methyl methacrylate monomer is moderately toxic by skin contact, eye contact, and inhalation. It is an irritant and causes headaches, irritability, and narcosis when inhaled. It is a common sensitizer, and may cause asthma. 2. Benzoyl peroxide hardener is flammable and explosive, and is a slight skin and eye irritant. See the section on Organic Peroxides later in the chapter for further details. 3. Finely divided acrylic polymer dust is also a sensitizer. 1. Wear gloves and have good local exhaust ventilation when using acrylic resins. If local exhaust ventilation is not possible, use a window exhaust fan, and wear a NIOSH-approved organic vapor respirator, if needed. 2. See section below for more information on peroxides. 3. Wear an NIOSH-approved toxic dust mask when handling finely divided acrylic polymer dust. Urea-formaldehyde, melamine-formaldehyde, phenol-formaldehyde, and resorcinol-formaldehyde resins are used as thermosetting adhesives and, in the case of phenol-formaldehyde, as a binder in sand casting. These are usually available as two-component systems with formaldehyde or paraformaldehyde as the hardener. While urea-formaldehyde and resorcinol-formaldehyde resins can be cured at room temperature, the others require heat. 1. Amino and phenolic resins contain formaldehyde, which is highly toxic by inhalation, highly toxic by eye contact and ingestion, and moderately toxic by skin contact. Formaldehyde is an irritant and strong sensitizer, and is a probable human carcinogen. 2. Phenol in phenol-formaldehyde resin is highly toxic by skin absorption and inhalation, and can severely burn skin. 3. If these resins are improperly cured and contain residual formaldehyde, they may cause irritation and allergic reactions. Trace amounts of free formaldehyde may cause allergic reactions in people who are already sensitized to it. 4. Machining, sanding, or excessive heating of the cured resins can cause decomposition releasing formaldehyde, carbon monoxide, hydrogen cyanide (with amino resins) and phenol (with phenol-formaldehyde resins). 1. Avoid using formaldehyde resin systems. 2. Wear gloves when handling amino and phenolic resins. Follow instructions carefully for proper curing. 3. Local exhaust ventilation is necessary if handling the cured resin involves heating and/or decomposition. 4. People who have become sensitized to formaldehyde will probably have to avoid these resins. Epoxy resins are used for casting, laminating, and molding, and as adhesives. When mixed with stone or metal dusts, they resemble actual stone or metal. Epoxy resins consist of two components: the epoxy resin; and hardeners, which are often amines. Mixing gives off heat which can vaporize solvents and other components. 1. Epoxy resins are moderately toxic skin and respiratory irritants and sensitizers. Resins containing diglycidyl ethers are probable human carcinogens, skin and eye irritants, and may damage the bone marrow. 2. Amine hardeners are moderately toxic by skin contact and highly toxic by inhalation. They are potent skin sensitizers and irritants, causing dermatitis in almost 50% of workers regularly exposed to them. They also can cause asthma, coughing, bronchospasm, and other respiratory difficulties. Other hardeners are also toxic. 3. Epoxy resins contain solvents of varying toxicity. 1. Wear goggles and gloves when using epoxy resins. 2. Use with local exhaust ventilation, or work at a bench against a window with a window exhaust fan. If ventilation is not adequate, wear a NIOSH-approved respirator with organic vapor cartridges for large amounts. 3. If the epoxy system contains flammable solvents, follow careful safety procedures for fire prevention (see our data sheet on Fire Prevention for more information). [Occupational contact dermatitis due to epoxy products frequently involves the exposed parts of the body, with the typical clinical features of an airborne contact dermatitis. Epoxy resins are in fact included in both the list of irritant and allergic contactants. We report here 7 cases of airborne occupational contact dermatitis due to epoxy products. Polyester resins are used for laminating, molding, and casting. For molding and laminating, fiberglass is the most commonly used reinforcement. In most polyester resins, styrene is used as the cross-linker; other cross-linkers include methyl methacrylate, vinyl toluene, and alpha-methyl styrene. Ketone solvents are sometimes included. Methyl ethyl ketone peroxide is the commonest hardener, although benzoyl peroxide and cumene hydroperoxide are also sometimes used. Promoters or accelerators used with polyester resin include cobalt naphthenate and dimethylaniline. 1. Styrene is moderately toxic by skin contact and highly toxic by inhalation. It is absorbed through the skin. Styrene is a probable human carcinogen, a potent narcotic, and a respiratory and eye irritant, causing coughing and burning of the eyes and nose. Styrene can also possibly damage the liver and nervous system. While it has good initial odor-warning properties, olfactory fatigue may set in. Vinyl toluene and alpha-methyl styrene have similar toxicity to styrene. Methyl methacrylate is discussed above. 2. Cobalt naphthenate is moderately toxic by skin contact and inhalation, and possibly causes allergies. 3. Dimethylaniline is highly toxic by skin absorption and inhalation causing methemoglobinemia (in which the hemoglobin in the red blood cells is converted into a form which will not release oxygen), resulting in cyanosis. Primary symptoms are a bluish discoloration of the lips, ears, and nail beds, and then headaches, weakness, and oxygen starvation. 4. The hazards of peroxide catalysts are discussed below. 5. Fiberglass is a skin and respiratory irritant. Inhalation of fiberglass dust created by cutting fiberglass or sanding the cured fiberglass-containing polyester can cause irritation and other respiratory problems. The classification of fiberglass is "reasonably anticipated to be a carcinogen," by the U.S. Department of Health and Human Services, and "possibly carcinogenic" to humans by the International Agency for Research on Cancer (IARC). 6. Styrene, vinyl toluene, a-methyl styrene, and cleaning solvents such as methyl ethyl ketone are flammable. Acetone is extremely flammable. 1. Wear gloves and protective goggles when pouring and handling polyester resins. 2. Use in a local exhaust hood or use a window exhaust fan with a NIOSH-approved organic vapor respirator. Large scale polyester resin use should be done in a large spray booth or while wearing a supplied-air respirator. 3. Clean up any spills immediately. Cover the work area with disposable paper towels or newspapers. 4. Do not use styrene for clean-up; instead, use acetone. 5. Wear clothing that covers the arms and legs and remove immediately after work; then shower. 6. Wear a NIOSH-approved toxic dust respirator when cutting fiberglass or sanding the cured sculpture. If the sculpture is not completely cured, wear organic vapor cartridges as well. 7. Cover exposed skin (neck, face) with a protective barrier cream. 8. Wear heavy neoprene rubber when handling dimethylaniline accelerator. Be very careful not to spill it on clothing since it can permeate through the material. 9. Store flammable solvents safely. Do not use solvents or resin near an open flame or lit cigarette. Store solvent or resin-soaked rags or paper in an approved self-closing waste disposal can which is emptied every day. 10. See below for information on organic peroxides. Polyurethane resins can be used to make elastomers (e.g. coatings and molds), adhesives, and rigid or flexible foams. They are usually two-component systems, consisting of Part A - the polyol, and Part B - the isocyanates used to cross-link the polyol. The polyol also contains such as metal salts or amine catalysts. Foaming systems also contain blowing agents, often fluorocarbons (e.g., freons). Polyurethane elastomer resins can be one or two component systems. The one-component systems are air or moisture cured. Most household urethane varnishes and paints do not contain isocyanates, but are the finished polyurethane dissolved in solvents, which dry by evaporation. 1. Isocyanates are extremely toxic by inhalation, causing bronchitis, bronchospasm, chemical pneumonia, and severe acute and chronic asthma at very low concentrations, even in people without a prior history of allergies. They also cause severe eye irritation. Methyl isocyanate was the chemical that killed over 2500 people in Bhopal, India when released into the atmosphere several years ago. The degree of hazard depends on the volatility of the diisocyanate and its physical form. TDI (toluene diisocyanate) is the most volatile and the most hazardous. MDI (diphenyl methane diisocyanate) is less volatile and, less hazardous than TDI. Polymeric isocyanates usually contain about 50% MDI. If heated or sprayed, any isocyanate is extremely hazardous. Note that isocyanates cannot be detected by odor until the concentration is many times higher than recommended levels. 2. Amines used as catalysts are moderately toxic by skin or eye contact or inhalation since they are sensitizers and irritants. 3. Organotin compounds used as catalysts are highly toxic by skin absorption, damaging the liver and nervous system. They may also cause skin allergies and irritation. 4. Fluorocarbon blowing agents used for foaming are slightly toxic by inhalation. They can cause narcosis at high concentrations, changes in the heart rhythm (arrhythmia), and even cardiac arrest at very high concentrations. 5. One-component polyurethane systems using precapped isocyanate polymers are less hazardous than the two-component systems due to low volatility, unless they are sprayed. 6. Dust from sanding and cutting finished polyurethane may cause skin and respiratory problems due to the presence of unreacted chemicals from the curing process. 7. Heating polyurethane is highly hazardous, since decomposition products include carbon monoxide, nitrogen oxides, acrolein, and hydrogen cyanide, all of which are highly or extremely toxic by inhalation. 1. Do not work with polyurethane resins if you have any history of allergies, asthma or other respiratory problems. 2. Do not spray polyurethane resins unless it is done inside a spray booth or you wear a supplied-air respirator (e.g. self- contained breathing apparatus). 3. Mix polyurethane resins in a local exhaust hood, or wear a NIOSH-approved full face gas mask with organic vapor canister or air-supplied respirator. Use an exhaust fan to remove the vapors from the room. 4. Wear gloves and goggles when handling these resins. 5. When sawing, sanding, or otherwise fabricating polyurethane, wear a NIOSH-approved respirator with organic vapor cartridges and toxic dusts and mists prefilters. Silicones and natural rubber can be used as sealants, adhesives, molds, and mold releases. There are two basic types of silicone resins: single-component systems that are cured by atmospheric moisture; and two-component systems that are cured by peroxides. These can contain solvents such as acetone or methylene chloride. Water-based natural rubber latex can also be used to make molds. Other compounds include rubber or contact cements containing rubber dissolved in solvents such as hexane, naphtha, and 1,1,1-trichloroethane. Rubber cements and latex rubber dry by evaporation. 1. Single-component silicones (including spray types) release acetic acid or methanol into the air. The acetic acid is irritating to the eyes and respiratory system. Methanol is a nervous system poison and is moderately toxic by inhalation. 2. The silicone resin in two-component systems is moderately toxic and irritating by skin contact. 3. See below for the hazards of peroxides. 4. Natural rubber latexes contain skin-irritating chemicals, and can cause severe allergic reactions in some people. 5. n-Hexane, found in some rubber cements and contact adhesives, is extremely flammable, and can cause peripheral nervous system damage chronic inhalation. 6. Methylene chloride is highly toxic by inhalation. It may cause narcosis and changes in heart rhythm (arrhythmia). It is also converted into carbon monoxide in the body. Smokers and people with heart problems are at higher risk. 7. 1,1,1-Trichloroethane is moderately toxic by inhalation, and can cause death at very high concentrations (e.g. in enclosed spaces). 1. Substitute water-based or heptane-based rubber cements and contact adhesives. 2. Use rubber cements containing hexane with good ventilation to prevent build-up of vapors. Do not allow smoking or open flames when hexane or acetone is present. Store large amounts (greater than one pint) in approved safety containers. 3. People with heart problems should not use methylene chloride-containing products. 4. Wear gloves and goggles when handling silicone resins, rubber latex or solvents. 5. See the section on organic peroxides. Organic peroxides are commonly used as hardeners or catalysts (more accurately initiators) for curing polyester, acrylic, and some types of silicone resins. Common peroxides used are benzoyl peroxide, methyl ethyl ketone peroxide (not to be confused with the solvent methyl ethyl ketone), and cumene hydroperoxide. Usually these peroxides come as liquids or pastes dissolved in materials like dimethyl phthalate. 1. All organic peroxides are highly flammable and often explosive. Benzoyl peroxide becomes a shock-sensitive explosive above 120øF (49øC) and explodes above 176øF (80 øC). Methyl ethyl ketone peroxide (MEK peroxide) can decompose by sunlight and explodes above 230øF (110øC); it is extremely shock sensitive. These peroxides can also decompose explosively when mixed with mineral acids, plastic resin accelerators, and many combustibles. MEK peroxide forms an explosive mixture with acetone. 2. Methyl ethyl ketone peroxide can cause blindness if splashed in the eyes. Cumene hydroperoxide is moderately toxic by skin and eye contact and may have cumulative effects. It may also cause allergies. Benzoyl peroxide is only slightly toxic by skin contact, and somewhat more toxic by eye contact. 1. Store peroxides separately from other combustible materials, and keep in original (never glass) containers. 2. Do not store large amounts of organic peroxides, or keep them for long periods of time. 3. Never dilute peroxides with other materials. Never add accelerators to peroxides, or acetone to MEK peroxide. 4. Do not heat peroxides. 5. Use disposable paper cups and wooden sticks for mixing small amounts of resin and peroxide. Otherwise use polyethylene, glass, or stainless steel containers. 6. Soak all tools and containers in water before disposal. 7. Clean up spills immediately by soaking up the peroxide with vermiculite if in liquid form, or with wet vermiculite if in powder or paste form. Do not sweep since this has been known to start fires. Use nonsparking tools to clean up. 8. Do not discard unused peroxide or peroxide/vermiculite mixtures; this can cause a fire or explosion. Peroxides can be disposed of by reacting with the plastic resin or by carefully reacting with a 10% sodium hydroxide solution. Plastic sheets, blocks, and film can be fabricated by cutting, drilling, carving, sawing, heating, vacuum forming, and many other methods which use physical tools or processes. 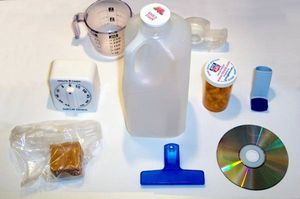 Examples of plastics which can be treated in this way include acrylic (lucite, Plexiglas), polyvinyl chloride, polystyrene, polyethylene, and polypropylene. Foamed plastics (e.g. polystyrene and polyurethane) can also be sawed, sanded, and heated to form it into various shapes. Some plastics, such as polystyrene, polyvinyl acetate, and polyvinyl chloride, are available as molding pellets which can be heated in a mold. Plastics can be glued with solvent cements or other adhesives. 1. Some polymer dusts may cause irritation or allergies if inhaled due to the presence of an unreacted monomer of other additives. Examples are phenolic and amino plastics, acrylic powder, and polyurethane dusts. 2. Heat decomposition of finished plastics can result from processes such as hot wire cutting, electric sanding, drilling, and sawing, producing highly toxic gases such as carbon monoxide, monomers, nitrogen oxides and hydrogen cyanide. 3. Heating acrylic plastic results in decomposition to the monomer methyl methacrylate, a respiratory irritant, sensitizer and narcotic (see the section on Acrylic Resins). 4. Heat decomposition of polyvinyl chloride (PVC) occurs above about 400øF (205øC), releasing highly toxic hydrogen chloride gas. Exposure can cause "meatwrappers asthma", a disease noted among meatwrappers who hot wire PVC film. 5. Heat decomposition of foamed polystyrene (styrofoam) or polyurethane can release a large variety of highly toxic gases including nitrogen oxides, hydrogen cyanide, carbon monoxide, and monomers (e.g., styrene). 6. Heating polyfluorocarbons can cause polymer fume fever, a disease similar to metal fume fever, with symptoms of nausea, chills, fever, headaches, coughing, and shortness of breath. This is often caused by smoking a cigarette in the presence of fluorocarbon dust. The cigarette's heat is high enough to decompose the fluorocarbon. 7. Many of the solvents used to cement plastics are highly toxic. Acrylic cements in particular commonly contain chlorinated hydrocarbons such as ethylene dichloride or methylene chloride. Both are probable human carcinogens and narcotics, especially ethylene dichloride, which can also cause liver and kidney damage. Methylene chloride is converted into carbon monoxide in the body and can cause heart arrhythmias. This is especially hazardous for smokers and people with heart problems. 1. Have good general ventilation or local exhaust ventilation when fabricating plastics. Use water-cooled or air-cooled tools to keep decomposition of the plastic to a minimum. In heat fabrication processes, use the lowest temperature possible to avoid decomposition of the plastic. 2. You may need an organic vapor respirator to work safely with acrylic plastics if you do not have adequate ventilation. Use a NIOSH-approved respirator with combination organic vapor/acid gas cartridges with PVC. 3. Sanders, saws, and other electric tools that generate a lot of dust should be equipped with dust-collectors. 4. Clean up by vacuuming or wet mopping; not sweeping. 5. Wear gloves and goggles when handling solvent cements. Use as low toxicity a solvent as possible, for example, acetone instead of chlorinated solvents. Additives used with plastics and their resins include plasticizers, stabilizers (e.g., ultraviolet absorbers andantioxidants), colorants (dyes and pigments), fillers (e.g., talc, quartz, clay, fused silica), reinforcements (e.g., fiberglass), fire retardants, inhibitors, accelerators, and solvents. Inhibitors and plasticizers may be already in the resin or added later. These additives are discussed in other CSA data sheets: mineral additives, and phthalate plasticizers - "Traditional Sculpture;" pigments - "Art Painting and Drawing;" and dyes - "Dyeing Safely." Many organic phosphate esters can be absorbed through the skin, and inhalation or ingestion may cause central nervous system damage, possibly leading to paralysis, convulsions or anesthetic effects. Some act like mild nerve gases, and are skin, eye, and respiratory system irritants. Examples are tributyl phosphate, tri-para-cresyl phosphate, and the most toxic tri-orthocresyl phosphate (TOCP), which should be avoided. * This data sheet was adapted from chapter 16 of Artist Beware by Michael McCann. This article was originally printed for Art Hazard News, © copyright Center for Safety in the Arts 1989 and 1995. It appears on nontoxicprint courtesy of the Health in the Arts Program, University of Illinois at Chicago, who have curated a collection of these articles from their archive which are still relevant to artists today.